The first teaser trailer for Captain Marvel has finally been released, and Marvel fans are thrilled. The movie is set in the ’90s, but it is also a crucial setup for next year’s Avengers 4. Carol Danvers, aka Captain Marvel, will prove to be a powerful ally in the battle against Thanos. Marvel has been quite good at keeping the production under wraps, so this trailer has several revelations. It gives us the first look at Brie Larson in the character’s trademark red costume. It also shows off young Nick Fury, and reveals brief footage of the shape-changing alien Skrulls. The trailer gives us some sense of how powerful Captain Marvel really is. In the opening sequence, her spaceship is shot down, presumably by the Skrulls, and disintegrates as it enters Earth’s atmosphere. Incredibly, Carol survives a free-fall to Earth. The trailer showcases Carol’s strength and agility as she effortlessly leaps on to the roof of a subway train, and then projects stunning energy blasts. That’s likely just a hint of what she can do. At the end of the trailer, we see Carol Danvers with alien energy coruscating around her. That’s reminiscent of her “Binary Form” in the comics, in which her powers are super-charged to the extent that she can take down starships without assistance. 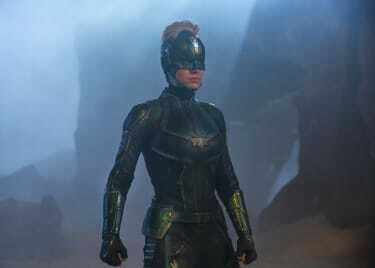 Marvel has developed a strong reputation for the quality of their de-aging CGI, but Captain Marvel will be their toughest challenge yet. Jackson and Gregg won’t just be de-aged for a couple of brief scenes; they’ll be de-aged for the duration of the entire film. The trailer gives viewers their first glimpse of the younger Fury and Coulson, and it proves that Marvel’s tech is up to the task. The trailer only gives a few brief glimpses of the Kree Starforce. That’s an elite tactical unit the Kree government deploys in its millennia-old war against the Skrulls. Curiously, all the confirmed characters who are part of the Starforce are traditionally villains. The sole exception appears to be Jude Law’s enigmatic commander, who was originally identified as the Kree superhero Mar-Vell. That’s looking increasingly unlikely, with Marvel refusing to confirm or deny just who Law is playing. One popular theory is that he’s actually a villain named Yon-Rogg, who is tied to Captain Marvel’s origin in the comics. If that’s the case, then Carol Danvers is probably being manipulated. The Kree could even be villains. It’s probably too soon for Marvel to show us the shapeshifting Skrulls in all their glory; the CGI still looks a little unfinished. 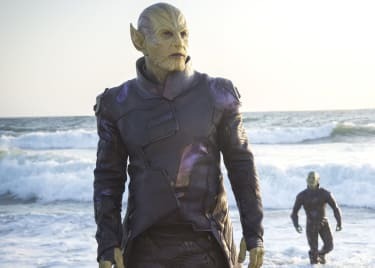 What is clear is that a group of Skrulls has come to Earth. Ben Mendelsohn is confirmed to be playing the part of Talos, spearheading an invasion of our planet. He’s even successfully infiltrated S.H.I.E.L.D. Meanwhile, that old woman Carol punches in the trailer is very likely a Skrull in disguise. A single question echoes through the trailer: Who is Captain Marvel? As she observes when talking to Fury, Carol herself doesn’t know the answer. It looks like the Kree have been manipulating her memories to make her think she has always worked as a Starforce agent. In reality, just as in the comics, Carol Danvers is a human who was exposed to alien energies and gained phenomenal power as a result. Coming back to Earth has opened the floodgates of Captain Marvel’s memories, and she’s struggling to work out just who she really is. The key may be Maria Rambeau, Carol’s co-pilot friend glimpsed in one flashback. 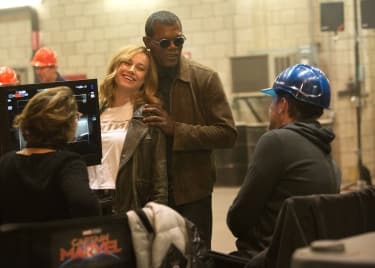 In the comics, the Rambeaus hail from New Orleans, and filming of Captain Marvel headed there for a couple of weeks before it wrapped production. Presumably, Carol will manage to track down her fellow pilot and learn the truth about who she is. And comic book readers will recognize Maria as the mother of one of Carol’s fellow superheroes, Photon.